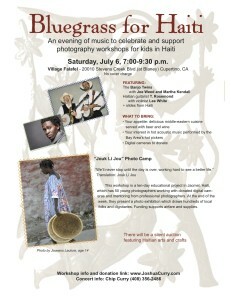 An evening of hot banjo pickin’ and Haitian grooves to help inspire and educate kids in Haiti. Chip Curry will be there with the Banjo Twins. Renowned Haitian musician T. Rosemond will also be performing. He won the Haitian equivalent of American Idol. Other special guests dropping in. Not to be missed! There will also be a silent auction with distinctive handmade Haitian crafts and lots of other quirky items we’ve got coming in. I’ll be talking a bit about what we actually do down there and giving people a chance to see the incredible imagery the students made. It’s going to a fun night, save the date! Next Post →Jouk Li Jou Kan Foto 2013 – our third annual Photo Camp for Haitian Youth is coming up!